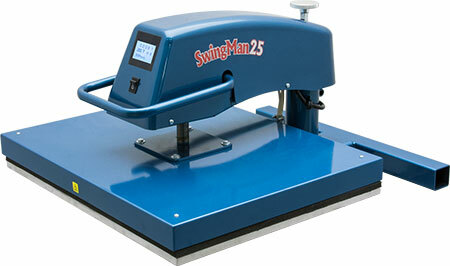 The SwingMan 25 represents the latest generation in heat press design from HIX. The SwingMan 25 features a 20" x 25" swing away heat platen that will meet the needs of any textile or sublimation business. With repeatable print gap settings up to maximum up to 1-3/4' thick, the Swingman 25 is great for tiles, plaques, garments and 3-D items. The heads up display also features digital time and temperature control from ambient temp to 450°. The over-center lever provides easy lock down with a full range of pressure adjustments which along with the easy-swing platen make the Swingman 25 one of the most versatile presses on the market.